If, like myself, you've been an astronomy enthusiast for any lenght of time, then making any new discovery, of any kind, can be a cool experience. Well, I received an interesting email from a long time follower who was curious about a certain picutre posted in the Stars section of this web site. 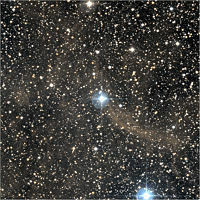 Investigating the image ( shown below ) I noticed a cloud of nebulosity that was not on the original survey image I had downloaded ( see below, light green arrow [original FITS, conversion name.jpe, name.jpg formats] ) from the Aladin previewer website  both images blinked below for comparision. With some further research I also obtained the POSSI/E/DSS1 survey image which is also shown below enhanced ( green circle ). Original and enhanced images. The original received a light contrast increase so that the stellar cloud has just become visible. Credits: Palomar Observatory Sky Survey (POSSI, POSSII/F/DSS2) via the Aladin image previewer applet and website. ATLAS OF This atlas has been deprecated; use of the Pickles atlas is recommended instead. This is an optical spectrophotometric atlas of 161 stars having spectral classes O through M and luminosity classes V, III, and I and are from the observations of Jacoby, Hunter, and Christian (1984). Pickles Atlas A wide spectral coverage, consisting of 131 flux calibrated stellar spectra, encompassing all normal spectral types and luminosity classes at solar abundance, and metal-weak and metal-rich F-K dwarf and G-K giant components. Each spectrum in the library is a combination of several sources overlapping in wavelength coverage A.J. Pickles 1998, PASP 110, 863.